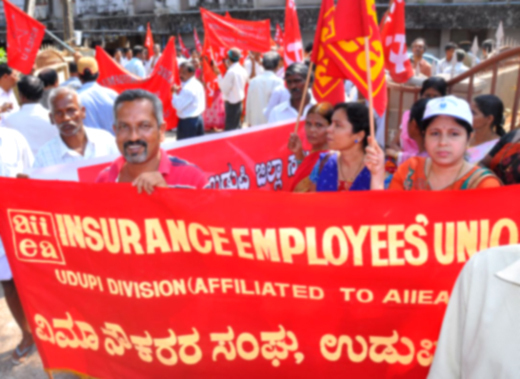 Udupi, August 12, 2018: LIC agents staged a protest against the Union government’s policies, which they claimed are destabilizing the public insurance company, at the regional office here. All India LIC Agents’ Association (Udupi) President A S Lokesh Shetty said that the LIC has immensely contributed to the progress of the country. “The LIC concentrates on rural areas. Sadly, the Central government, following its globalisation policy, is planning to corporatise LIC, thereby offering an opportunity for the foreigners to loot the country’s treasure. The amendments are made to the Insurance Bill unnecessarily and it has resulted in LIC agents suffering from the loss of livelihood,” he said. ‘LIC weakened’ : He alleged that the government-owned insurance company has been weakened and a conspiracy is being hatched in the direction. The foreign direct investment has been hiked to 48 per cent which has helped the private players in the game. IRDA has become the base for formulating wrong policies, he charged. He said that the commission is not hiked and the group’s insurance policies are not increasing. The government has failed to fulfil the demands of the LIC agents. The livelihood source of nearly 12 lakh insurance against in the country is at risk, he expressed apprehensions. He demanded that the pension schemes should be introduced for the insurance agents. A welfare fund should be set up. The financial help for health-related problems should be hiked to Rs 5 lakh. The direct selling of the insurance policies should be withheld, he said and added that the measures should be taken to renew the lapsed policies. The agitators demanded that the Goods and Service Tax (GST) imposed on the policies should be withdrawn and the LIC agents should be included in the category of unorganised sector. They demanded the livelihood security. Vice president L Manjunath said that the Central government’s initiative for oreign direct investment is nothing, but making the country’s treasures debted. The corporate companies pay less GST while the policyholders have to pay additional GST. This is a big burden it was pointed out.